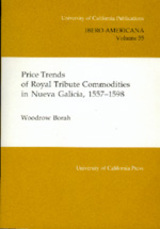 Royal treasury records of annual auctions of Indian tributes are the best source of price history for sixteenth-century Nueva Galicia. Using this data, the author has determined that from 1557 to 1598 the prices of some commodities such as maize rose more sharply than in the neighboring Audiencia of Mexico, whereas other prices, such as those for wheat, fell. The prices in the great mining center of Zacatecas, especially, differed from those in both Guadalajara and Mexico City.